Since 2010, BGR has been a regular partner and supporter of the What If? 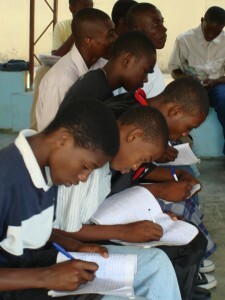 Foundation, a US-based organization working in Haiti. Our partnership began with BGR support for the Lamanjay free lunch program, funded by WIF. 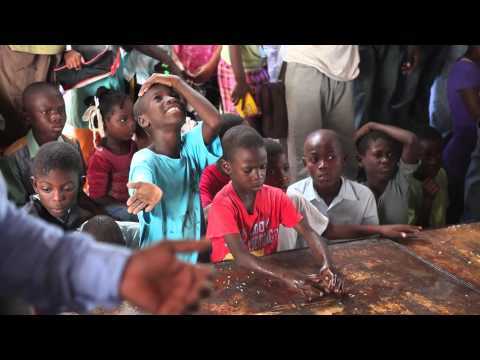 This program, which continues to this day, provides thousands of free meals to hungry children in the Ti Plas Kazo neighborhood of the Haitian capital Port-au-Prince—a substantial daily meal of vegetables, rice, and protein. For many of these children, the meal offered by Lamanjay is their only meal of the day. WIF scholarship recipients cracking their books. Aware that education is the most effective ladder up from poverty, in 2012 WIF started a scholarship program to enable poor children to attend school. They thereby opened doors of opportunity that in the past were tightly shut against children from poor families, who must pay exorbitant fees to enroll their kids in school. Almost from its inception, BGR has partnered on this program, too, and we have supported it consistently over the past three years. Now WIF is in the process of constructing a building to serve as a permanent home for the food and education programs. The building will bring a desperately needed school into this desperate neighborhood. Yesterday we received a message from Suzanne Alberga, WIF Executive Director, reporting on the progress of the project. Her message is just below. I hope this encourages you, our donors, and gives you some insight into how your donations to BGR, whether large or small, are having a positive and uplifting impact on the lives of these children. Remember that without such help, these curious, capable kids, so eager to learn, would not be able to attend school, and would thus face insurmountable obstacles to a life of dignity and decency. I am writing to share exciting news about the great progress being made on our “Building The Dream” project. You, as one of the project’s donors, are an important part of making this long-held dream a reality. Thank you for your support and encouragement! Children of Port-au-Prince watching the construction underway. 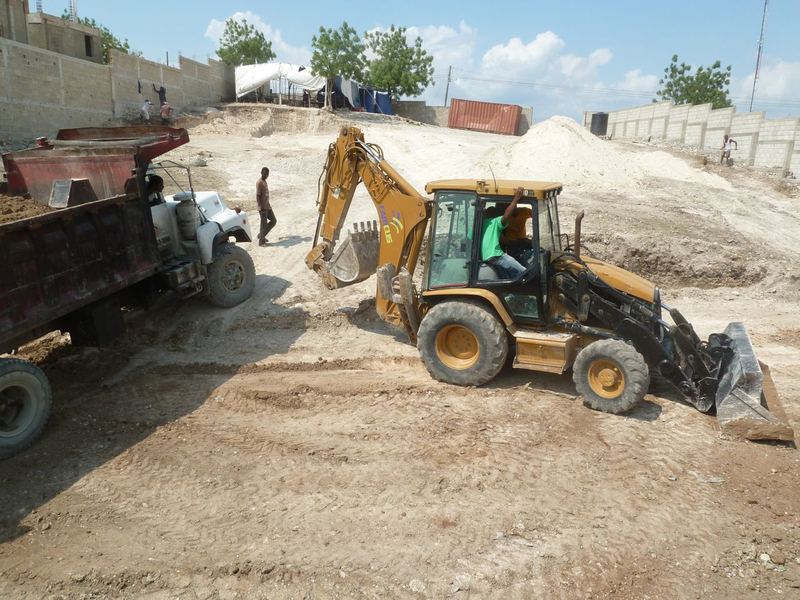 Building in Haiti has been a complex process, but after many months of careful planning with our partner Na Rive, architects, engineers, and construction companies, we are in the exciting stage of watching the new building take form. An experienced Port-au-Prince based crew is working hard in the summer heat and the new kitchen-cafeteria-school building is already more than one third complete! The Na Rive staff and entire community are deeply grateful and excited about all this new building represents. Not only will it offer a permanent home for the food and education programs we support, but it will also bring a desperately needed school into the neighborhood. Bulldozers at work on construction site. I recently visited the construction site and could feel hope and enthusiasm growing with every brick being laid. So much love and devotion has gone into this project over the years and now it looks like we’re just a few months away from its completion. To watch the building go up is very moving, very inspiring. And it wouldn’t have been possible without you. The project architect, Chuck Newman of Schools for Children of the World, together with the construction manager, estimate that the building will be complete by the end of the year! And, to prepare for this, we are in the final stretch of raising the resources needed to fully fund this construction project. To date, we have raised more than 90% of the building’s construction costs (about $700,000). And we have about $50,000 more to go. On behalf of the What If? Foundation board and staff, our founder Margaret Trost, our partner Na Rive, and all the children of Ti Plas Kazo, Mesi Anpil (thank you so much) for being a part of “Building The Dream”! This entry was posted in Education, Ending global poverty, Engaged Buddhism, News item, Projects & programs, Social justice and tagged Children's hunger, Engaged Buddhism, Girls' Education, Haiti, Social justice, What If Foundation. Bookmark the permalink.